Low-cost touchscreen. Laptop sales are in decline, the outlook is gloomy. Can a touchscreen help reverse this trend? HP certainly hopes so, equipping a 450 Euros (~$588) device with such a panel. But does this also equate to a possible tipping point for the cheap laptop segment? 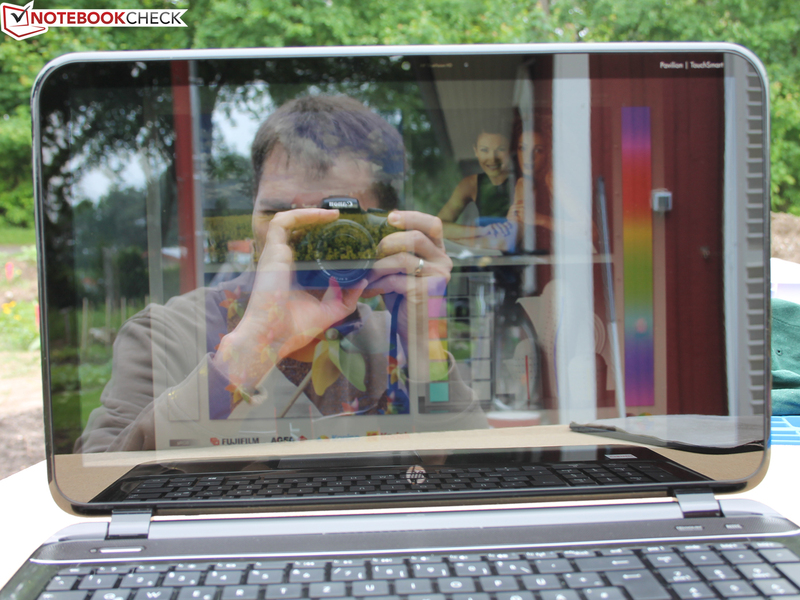 A cheap touchscreen device - but is the HP Pavilion Sleekbook TouchSmart 15 actually a decent choice? A slim, low-cost laptop with a touchscreen. 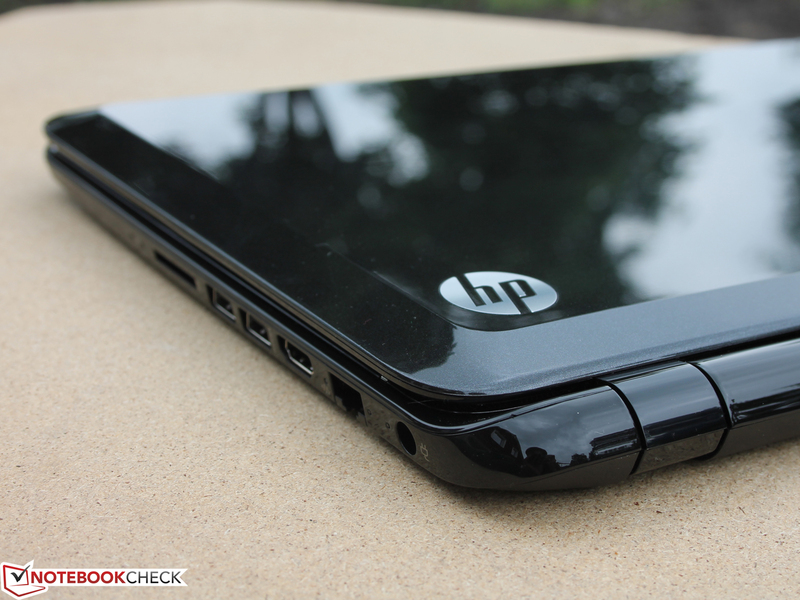 Simply put, this is exactly what the HP Sleekbook TouchSmart 15 boils down to. 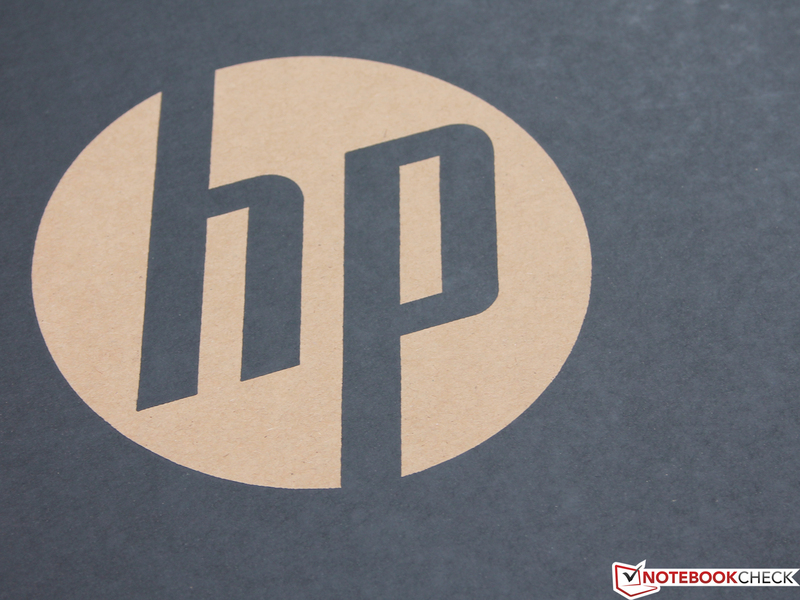 HP wants to sell two features which are apparently hip right now: touch input and a slim profile. Indeed, the 15-inch chassis is rather thin for a plastic case, but still doesn't become a threat to aluminum or magnesium cases due it being 3 centimeters high, while also falling short of achieving the same premium feel. The TouchSmart 15 can be had for 450 Euros (~$588) and up. Quite a starting price - which can only be upheld by using an AMD Trinity A4-4355M CPU instead of an Intel processor. The Intel Core i5-3337U version costs at least 600 Euros (~$784, with a touch panel), which may very well be too much for the targeted price-sensitive clientele. This version, but without the touchscreen - the Pavilion Sleekbook 15-b004SG (GT 630M) for around 549 Euros (~$717) - is used for comparison purposes. 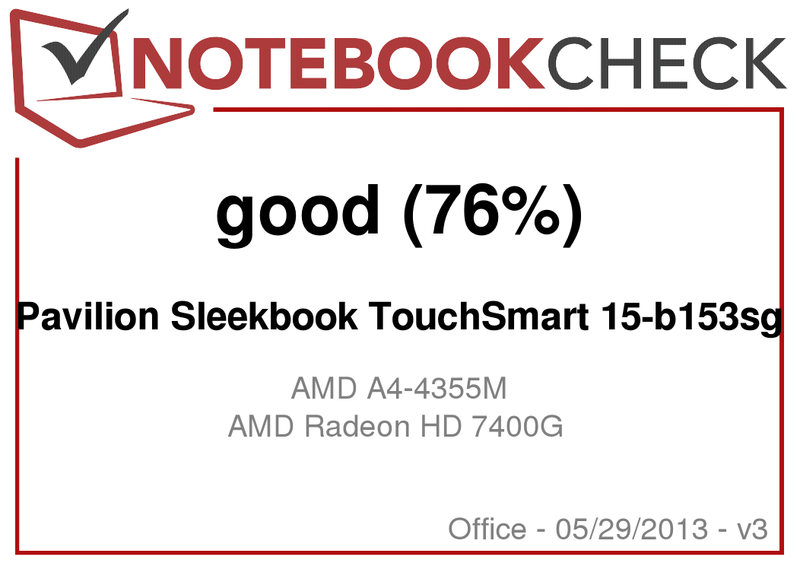 The cheaper AMD SoC - but without the touch panel (no "TouchSmart") - has already been examined by us in the review of the HP Pavilion Sleekbook 15 (AMD A8-4555M, US variant). Since our test device sports the exact same chassis as the Sleekbook 15-b004SG (Intel version), with the only difference being the touchscreen, we more or less omit the sections about build quality, connectivity and input devices, pointing to our earlier reviews for reference instead. Our main attention lies with the strengths and weaknesses of the HD touch panel as well as the combination of the A4-4355M APU with a Radeon HD 7400G. This is actually the first time we have had a chance to examine this exact GPU, leading to a number of gaming benchmarks. The AMD A8 quad-core CPU with which the US variant comes equipped is not even available in many other countries, thus we will focus our attention on the configuration at hand. So how great a touch-experience does the low-priced Sleekbook TouchSmart offer? Find the answer in our detailed review article below. Sturdy lid with a hard, touch-sensitive surface. The chassis has remained essentially unchanged, the only modification being due to the touch panel. This leads to an edge-to-edge sheet of highly reflective plastic in front of the actual panel as opposed to the frame which used to surround the previously used glare-type display. Great: no clearances can be made out between these two layers. Any frame instead of an edge-to-edge panel would hinder any touch input near the rim while also leading to dust accumulating in the corners. The entire lid is framed by a rubber lip leading to a more uniform homogeneity of support when resting on the base unit while preventing scratches from occurring. Potential buyers will have to be happy about all the glossy surfaces. Basically, every last bit of the device, including the lid, the space between the keys and even the sides of the chassis, sports the same finish. Accordingly, every part of the device is extremely prone to accumulating fingerprints so that not only the reflective display has to be polished often. Luckily, the touch panel is quite stable, feeling comfortably sturdy. We cannot say whether there is actually a layer of Gorilla glass on top, but at least applying pressure on the rear side of the lid does not lead to any alterations in the colors the touch panel displays. The lid is astonishingly well-built, especially considering that this is a device in the 450 Euros (~$588) segment. Unfortunately, the hinges are not as good, not being able to keep the heavy lid firmly in place (also, the lid cannot be opened by more than 130 degrees). This noticeable wobbling is a bad thing as every touch input with our fingers caused the display to bounce down and up again. Better results could be reached when holding on to the screen with the left hand. 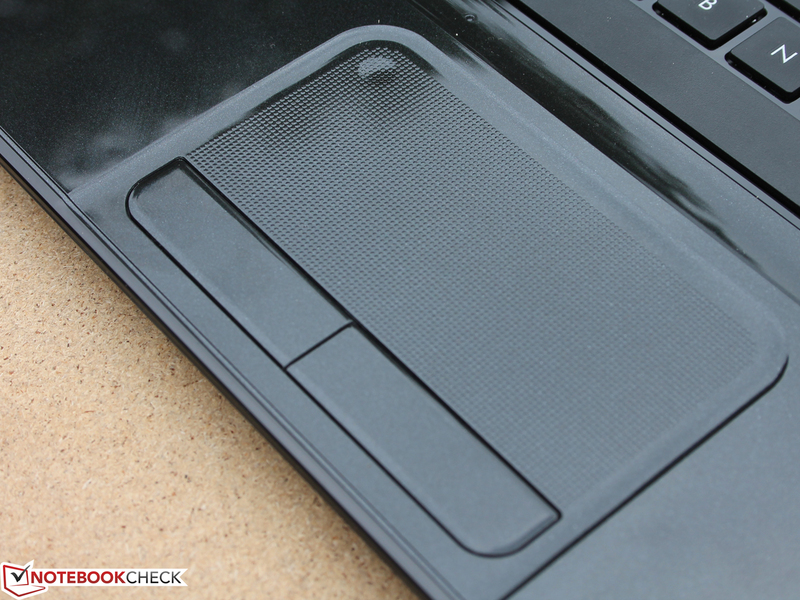 An examination of the other characteristics of this barebone (including its ports, software, maintenance options and input devices such as the keyboard and the trackpad) can be found in our review of the Pavilion Sleekbook 15-b004sg (Intel, non-touch). 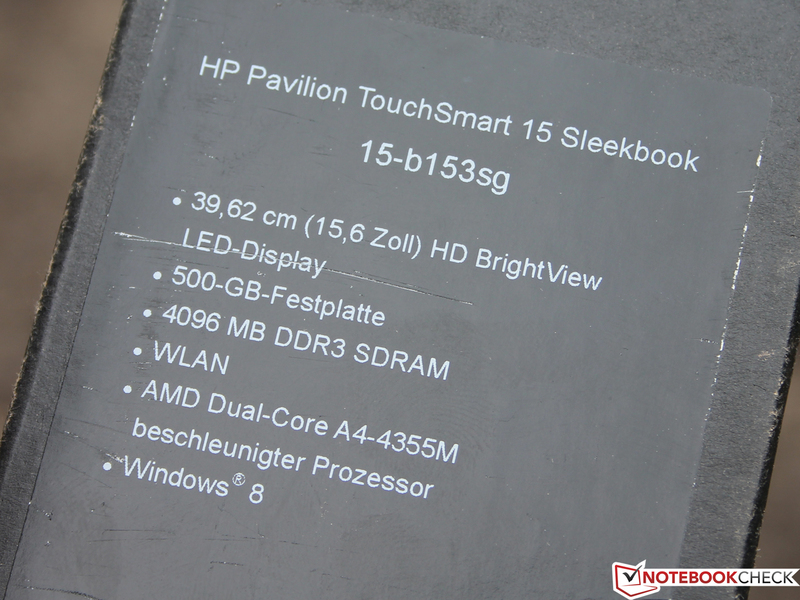 HP equips its Sleekbook 15 with a glossy 15.6-inch touchscreen with a native resolution of 1366x768 pixels. Other display resolutions and panel types (this version sports a TN LED panel) are not available. While HP doesn't disclose the number of fingers which can be used simultaneously (10-finger multitouch? ), touch input was always fast and very reliable. Unfortunately, the display was extremely dim, barely exceeding a brightness of 140 cd/m². Thus it fares even worse than its sibling, the Sleekbook 15 b004sg, which offered 178 cd/m², or the Acer Aspire V5-571PG with 180 cd/m², which also offers a far better contrast ratio of 664:1 when compared to the TouchSmart's 262:1. 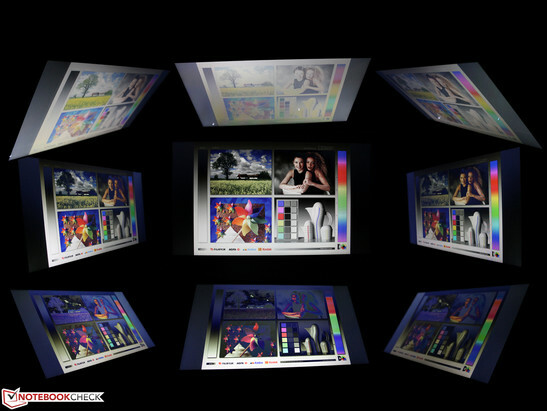 Color space rendition is only crucial to professional graphics designers or CAD workers, but these users will refrain from buying the Pavilion based on its low performance and it coarse resolution alone. Still, for the sake of completeness, only 50% of the sRGB color space is covered by the TouchSmart. We also examined the screen (in its delivery condition) with the help of a photo spectrometer (target color space: sRGB). The DeltaE 2000 deviations of around 10 during our grayscale tests are repellent. We wouldn't even need such a device for this analysis; the blue tint of the display is easily noticeable with the naked eye. The same holds true during our color saturation tests: Nearly all colors are off by a DeltaE 2000 of almost 10 (in the direction of blue within our color triangle). Outdoor usage is another problem. The low brightness in combination with the strong reflections renders the glossy display basically unreadable, even on cloudy days, as our photographs prove. The strong reflections are rather annoying. The viewing angles are on par with other TN panels, meaning that they are mediocre at best. Color inversion already begins at 15 degrees in the vertical direction and at around 45 degrees in the horizontal direction. These results are rather normal in this price range - the Aspire V5-571PG is no better concerning viewing angles. The A4-4355M (1.9 GHz) APU comes with one of the last dual-core Trinity-architecture processors which we didn't have the pleasure to review so far. 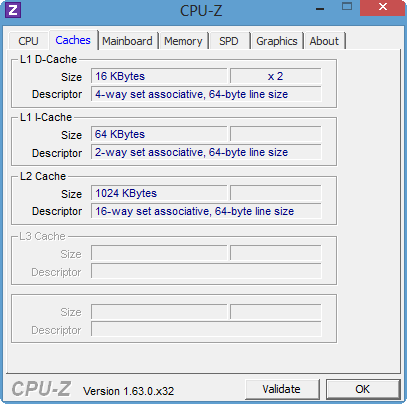 By now (June 2013), the successor, the quad-core Kabini (A4-5000) processor, has already been revealed, sporting a decreased clock speed, but better multi-threading performance. 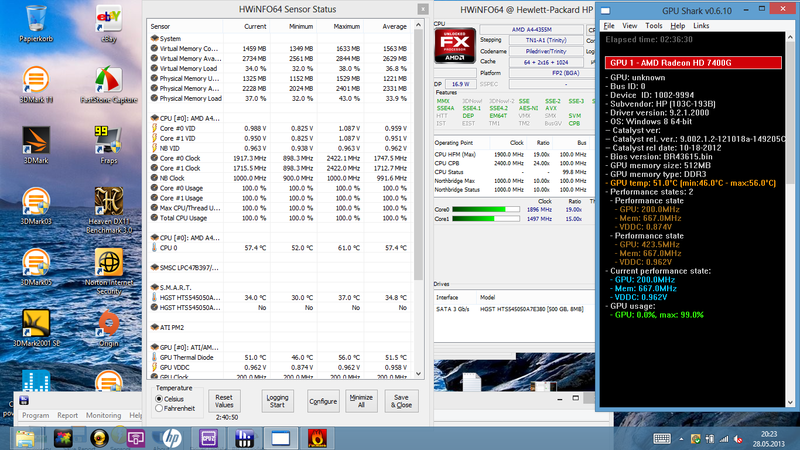 Coming back to the A4-4355M with its TDP (thermal design power) of 17 watts. The GPU integrated in this APU, the Radeon HD 7400G, is the weakest of all Trinity graphics cards, thus our expectations for the gaming benchmarks couldn't be much worse. The Hitachi Travelstar Z5K500 HTS54050A7E380 hard drive offers 500 GB of storage space. The laptop ships with one 4 GB RAM module, which could be swapped for a larger module (as is the case for the HDD). 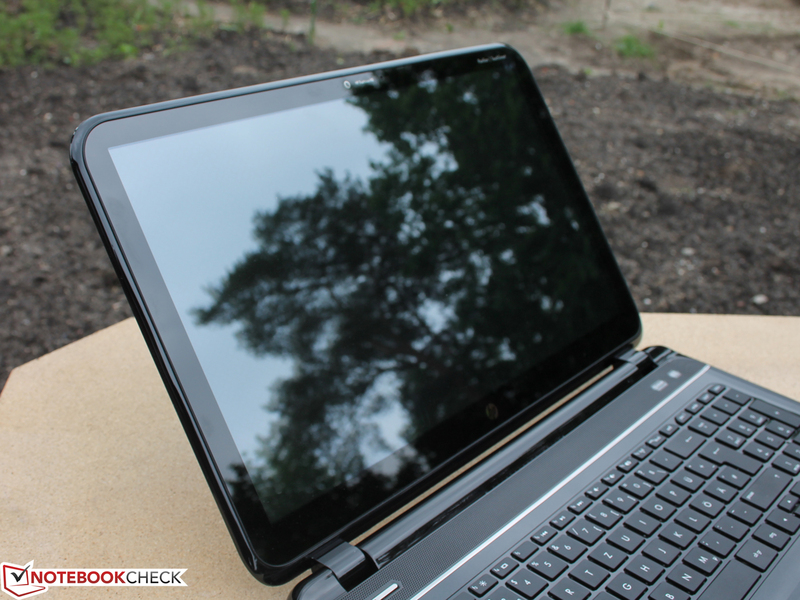 Our review of the Sleekbook 15-b004sg (Intel variant) shows how this can be accomplished without the presence of a maintenance hatch. We are employing the Cinebench R11.5 benchmark in order to measure the performance of the Pavilion's CPU, comparing it to the rest of the weak netbook APU-spectrum ranging from the E2-1800 to the ultrabook processor i5-3317U. Interesting: The new Temash-APU for small subnotebooks (have a look at the review of the Acer Aspire V5-122P) is faster by 42% during the multi CPU tests despite only clocking at 4 x 1.0 GHz. 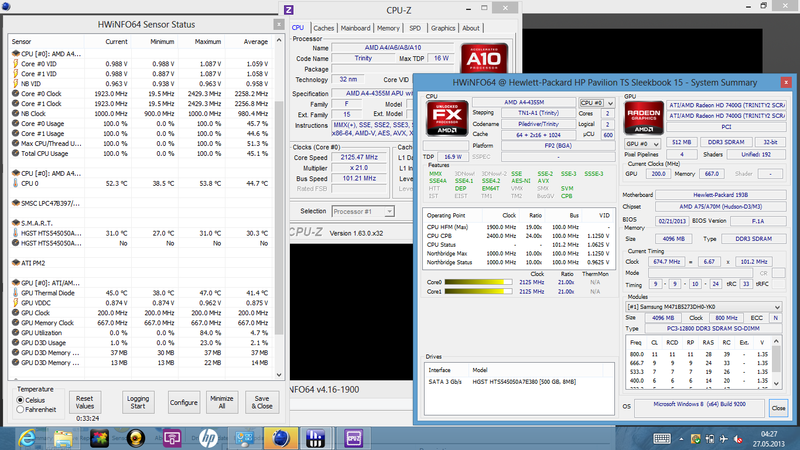 Accordingly, the A6-1450 beats it by 37% during the single CPU tests. The difference between the A4-4355M and Intel's low voltage processors and even the Celeron 1000M (a dual-core 35 watts CPU without hyperthreading, as used in the Toshiba Satellite C850) is significant, falling short by more than a factor of 2 during the multi-core tests. This holds true for other AMD processors as well. Even the quad-core Trinity A8 only beats the A4-4355M by 71% during the multi-core test while falling slightly behind (by 15%) during the single-core tests. 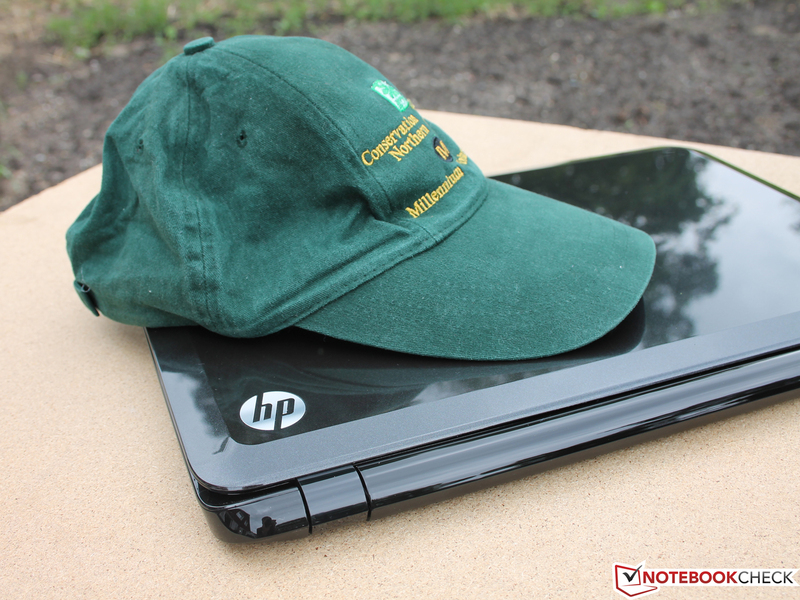 The petty E2-1800 in the HP 655 is only 8% slower than our test device! 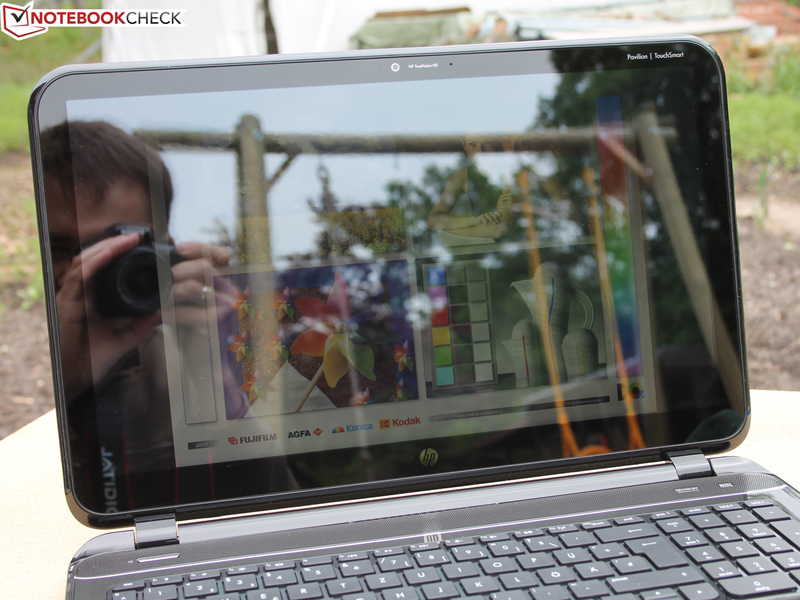 So does the Sleekbook TouchSmart really only offer yesteryear's netbook performance? 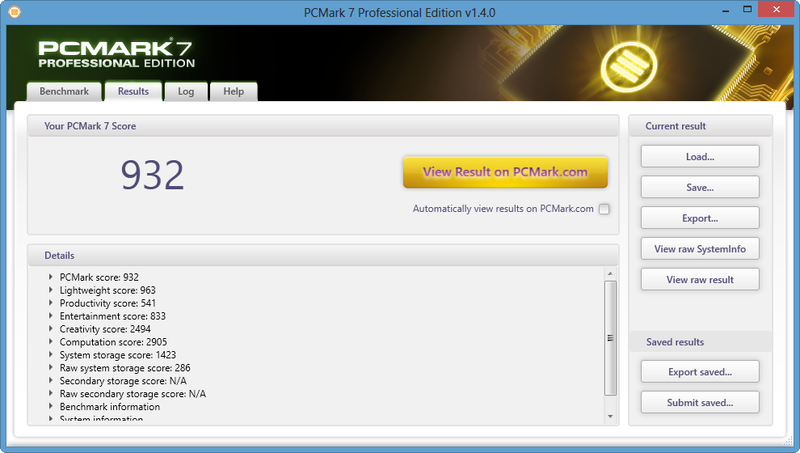 We took a look at its application performance during the PCMark benchmarks. 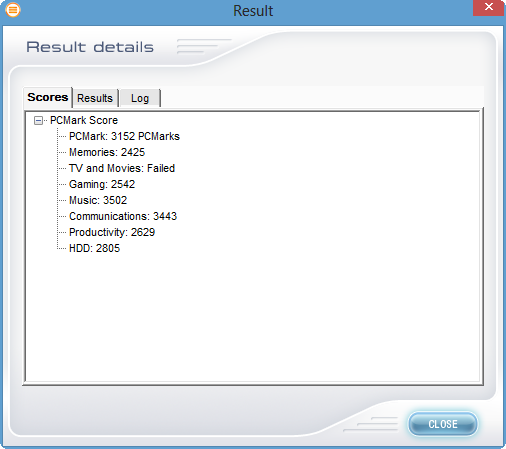 Indeed, the HP 655 actually manages to beat the Pavilion by 5% in PCMark 7. The newer "netbook" APU Temash (Kabini's little brother) even sprints ahead by 32%. We cannot help but call our test device's application performance disappointing - even Intel's weakest standard processor (Celeron 1000M, 35 watts), which can be had for less than 400 Euros (Satellite C850-1LX), offers 125% more overall performance. Even the perceived working speed is rather slow. Booting the system, starting or installing programs, copying files - everything feels rather slow-moving. But maybe the TouchSmart is at least less battery-hungry, leading to better runtimes? Our battery life tests will show. One of the reasons for the low system performance lies with the hard drive. 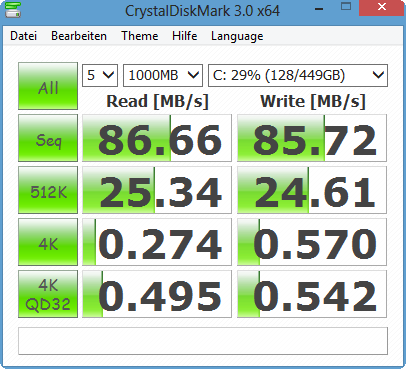 The Hitachi Travelstar Z5K500 only manages to speed up to 5400 rpm, yielding just 86 MB/s during the sequential read test. 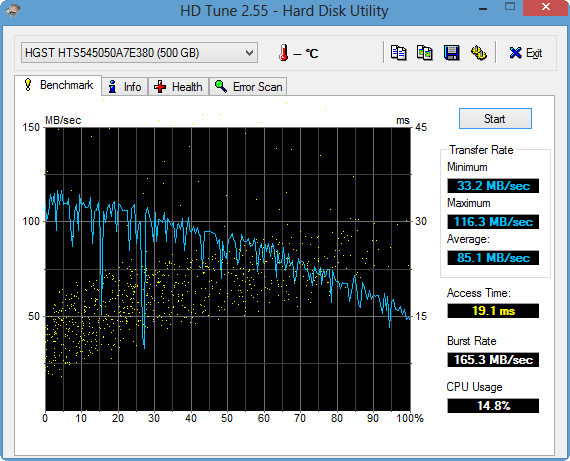 Even worse: It manages to fare worse than most other HDDs by 25 to 50% during the 4K test. 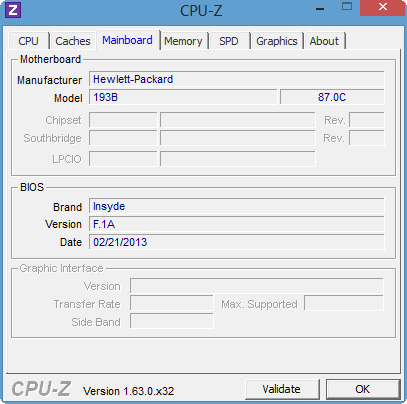 This is actually the reason why the HP 655 manages to beat our test device during the PCMark 7 test - despite being equipped with a nominally weaker Zacate APU. It simply manages to score better during the storage sub score. An SSD cache would lead to a tremendous boost in performance, as the HP Pavilion Sleekbook 15-b004sg with its PCMark 7 score of 3923 points shows. 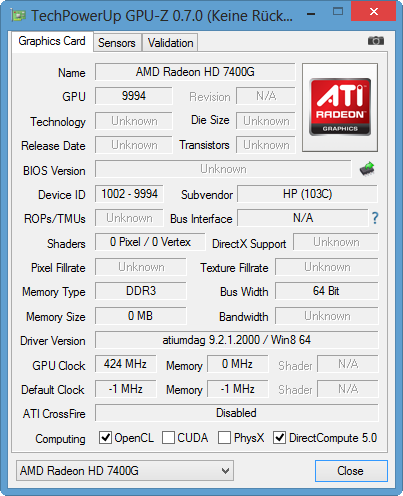 The AMD Radeon HD 7400G is the weakest integrated GPU of all Trinity APUs, with just 192 shader cores clocked at 327 to 423 MHz (the HD 7600G, which is used more frequently, offers 384 shaders at the same clock speed). On paper, the Pavilion's GPU supports DirectX 11 and Shader 5.0, but this is of no actual use due to its low graphics performance during gaming, which is only possible in low resolutions and without any fancy DirectX 11 effects. During the 3DMark 11 benchmark, the Radeon GPU only manages to beat the HD Graphics (Ivy Bridge) and the Radeon HD 7340. 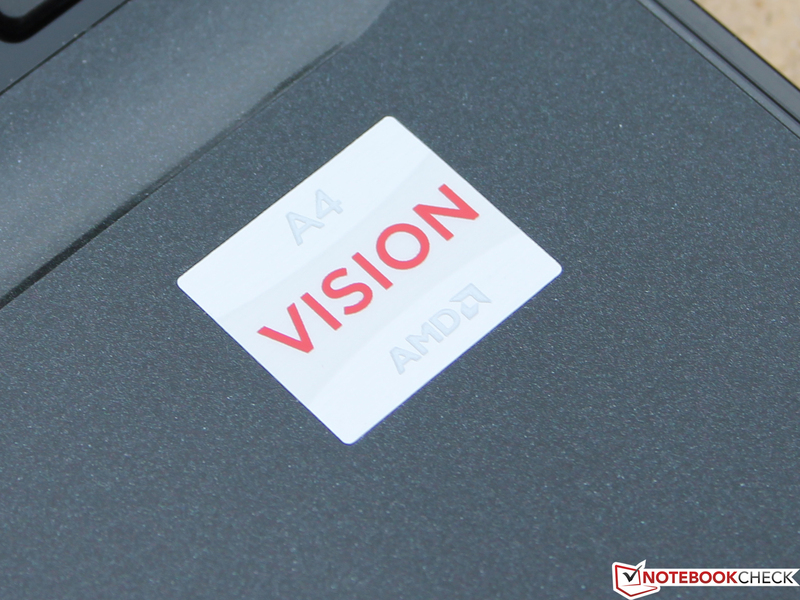 The Radeon HD 8250 of the A6-1450-APU (Acer Aspire V5-122P, 11.6-inch device), one of AMD's current subnotebook APUs, is on par with the HD 7400G. 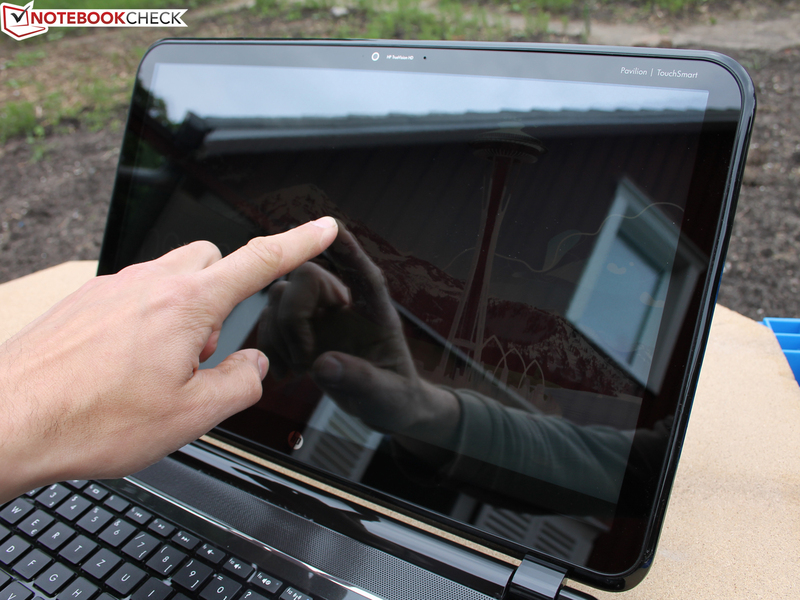 Thus, the Sleekbook TouchSmart 15 is stuck at subnotebook-like graphics levels. As we had expected after the 3DMark results, gaming performance is virtually non-existent. Only a few older, less-demanding games manage to run more or less smoothly with everything set to low (and usually a resolution of just 1024x768 pixels). Astonishingly, the integrated HD Graphics 3000 and HD Graphics (Ivy Bridge) made by Intel are up to 66% faster, as can be seen in the figures below for FIFA 13 and Mass Effect 3. So not all integrated GPUs made by AMD are able to beat Intel's integrated GPUs. 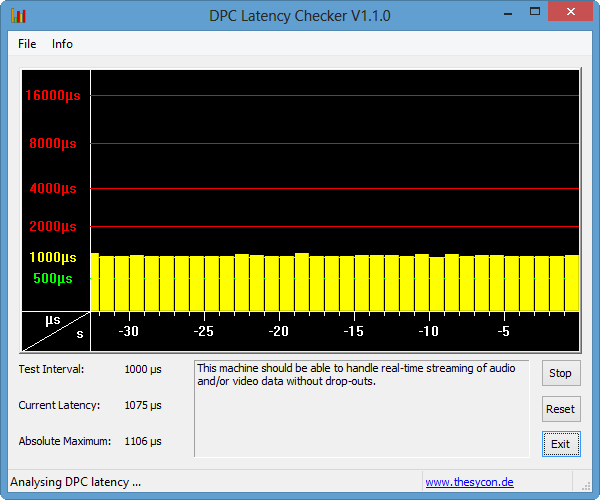 Again, the HD 7340 is only marginally slower (by 13%). For just 100 Euros (~$130) more, the 15-inch Acer Aspire V5-571PG (540+ Euros, ~$706) comes with both a GeForce GT 620M (leading to a better FIFA 13 performance by 210%) and a much faster Core i3-2365M. If you are into gaming, there is no reason whatsoever to choose the Sleekbook TouchSmart 15 instead of its competitor. 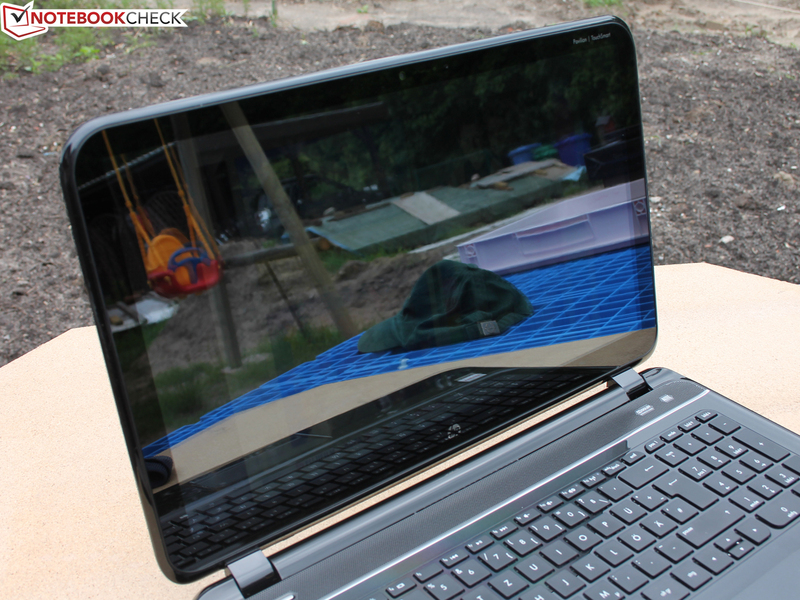 So far we have talked much about the low performance of the TouchSmart's AMD hardware. But does this at least lead to adequately low noise and heat emissions during usage? Actually, it does. While not remaining completely silent, the fan barely exceeds 35 dB(A) while browsing the web, composing e-mails or working with Office. Usually, however, emission levels are close to those of the background noise measured in our test chamber. This does not mean that the fan is turned off, but rather that it keeps spinning very slowly and quietly. 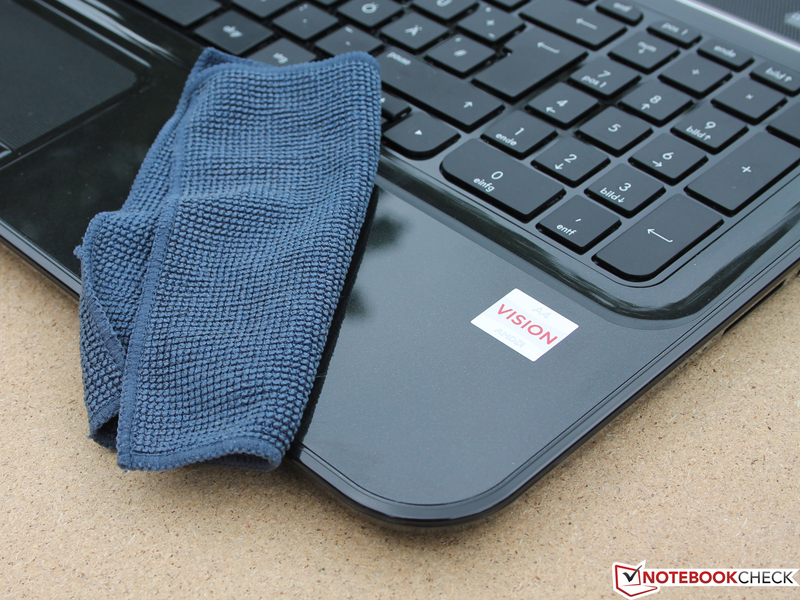 Possibly thanks to the constant activity of the silent fan, the laptop's surfaces remain cool at all times. 30 °C while idle is barely noticeable, and even under full load, a local temperature increase of 10 °C is never exceeded by much. On average, the upper and lower sides of the laptop only get warmer by 6 and 10 °C respectively. Even under a worst-case scenario, operation on one's lap should never be a problem. We also observed how the CPU clock speed and temperature changes during different modes of operations. While the stress test was running, the clock speed of both cores remains between 1.7 and 2.2 GHz, often coming to lie within the Turbo range of more than 1.9 GHz. The 17 watts APU never exceeds 60 °C close to the CPU (and 51 °C at the GPU). 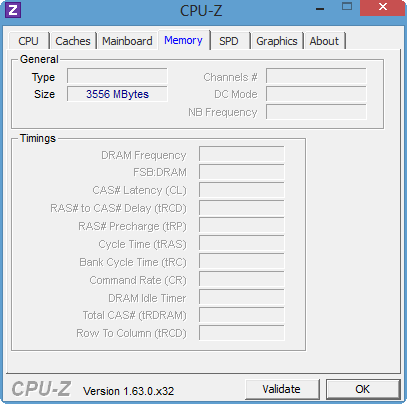 As long as the GPU and CPU don't have to split the incoming power between them (as they have to do during the stress tests, when both Prime 95 and Furmark are active, causing both GPU and CPU to work under full load), the CPU is clocked at 1.5 to 1.9 GHz (GPU @423 MHz while idle) during the strenuous multi-core test, reaching similar temperature levels as noted above. 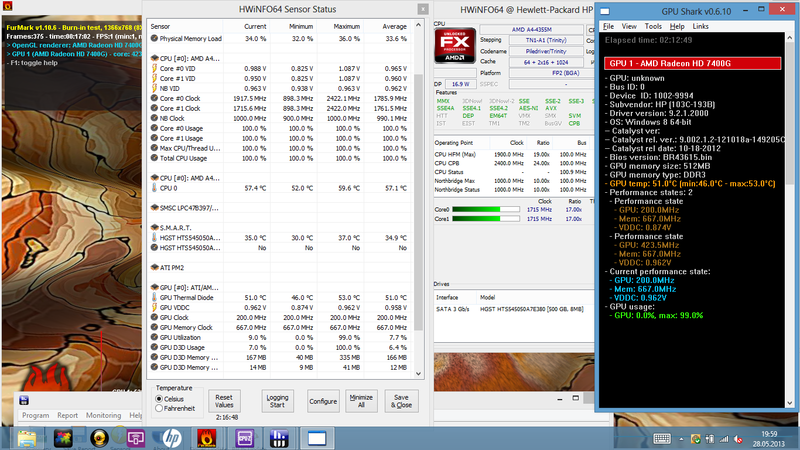 Another 3DMark06 test run right after the stress test yielded the same score as the one before. (-) The average temperature of the palmrest area of similar devices was 28.2 °C / 82.8 F (-4.5 °C / -8.1 F). The 65 watts power adapter requires 1:48 hours in order to fully charge the Pavilion's battery. Generally speaking, the laptop's power consumption pattern is close to that of its Intel sibling, with some differences under full load. The following holds true for basically all AMD and Intel APUs with integrated graphics: While the Intel Sleekbook requires 55 to 57 watts (medium load / full load), a comparable AMD model only needs 26 to 29 watts. But as mentioned in the "Performance" section, the Intel variant (i5-3317U) yields a far better CPU performance, beating AMD by 100 to 230% (single-core tests and multi-core tests respectively). While idle, both the Intel Sleekbook and our AMD-based system require 7 to 11 watts, so that the AMD APU is not really more power-efficient than Intel's counterpart in this scenario. Similar results hold true for the Aspire V5-571P, which is content with 9 to 11 watts (sporting a comparably dim touch display as the Pavilion). Intel's counterpart, the Sleekbook 15-b004sg (i5-3317U @ 1.7 GHz) manages to hold out for 1:22 to 5:34 hours (under full load / while idle and set to 150 cd/m²). Its more realistic Wi-Fi runtime (again, at 150 cd/m²) boils down to 2:45 hours. This almost identical device (albeit without a touchscreen) comes equipped with the exact same 37 Wh Li-Ion battery. 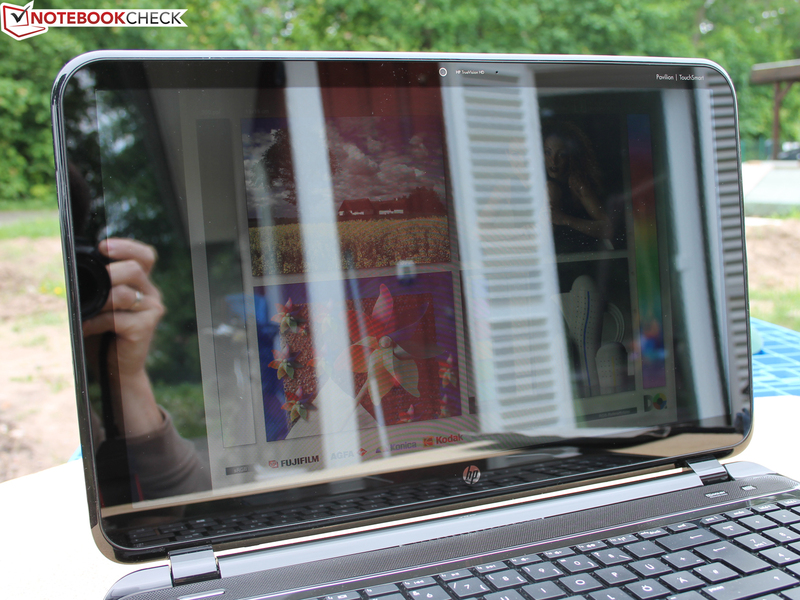 Unfortunately, our Sleekbook TouchSmart does disappoint us in this regard. 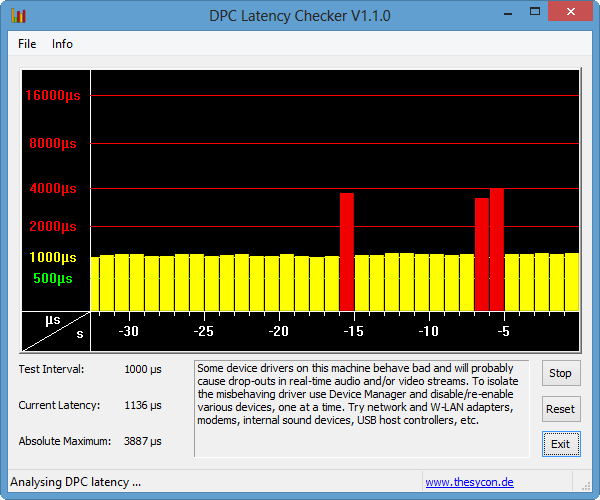 Despite its weak hardware components, no more than 3:09 hours are reached during our Wi-Fi tests. At least under full load its battery life is better than the Sleekbook's by more than half an hour. The well-comparable Aspire V5-571P-6499 (it sports a 37 Wh Li-Ion battery as well) manages to get to 2:23 hours (Wi-Fi test) before it dies, faring somewhat worse than the TouchSmart. The battery of the Pavilion can be replaced, but there is no other option next to the 37 Wh variant. You are looking for a simple touchscreen laptop and don't want to spend more than 450 Euros (~$588)? 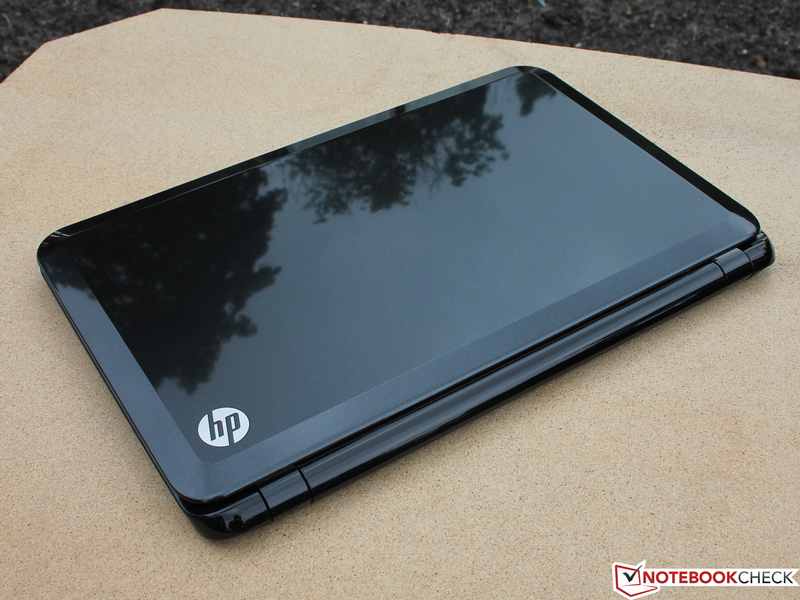 In this case, the HP Pavilion Sleekbook TouchSmart 15-b153sg (D2W96EA) may be your only choice. The oft-cited Aspire V5-571P (another 15.6-inch touchscreen device) costs at least 565 Euros (~$738), while offering a similarly mediocre experience in terms of display quality and battery life. 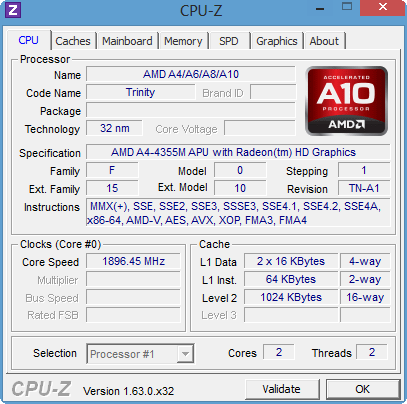 However, its Core i3 (some variants ship with an i5 as well) is very well capable of resulting in a far better system performance than the AMD APU of our test device. Asus' VivoBook S300CA (a 13.3-inch device) fares a lot better than our TouchSmart, especially with regard to build quality, stability and the performance levels of its Intel chip. There are also 14-inch and 15-inch variants (VivoBook S500CA), but those cost 620 Euros (~$810) or more. If a smaller, more lightweight device is in your interest, Acer's Aspire V5-122P (with an AMD APU) might be worth a closer look, especially so because of its bright, razor-sharp 11.6-inch display. The V5-122P can be had for as little as 399 Euros (~$521). 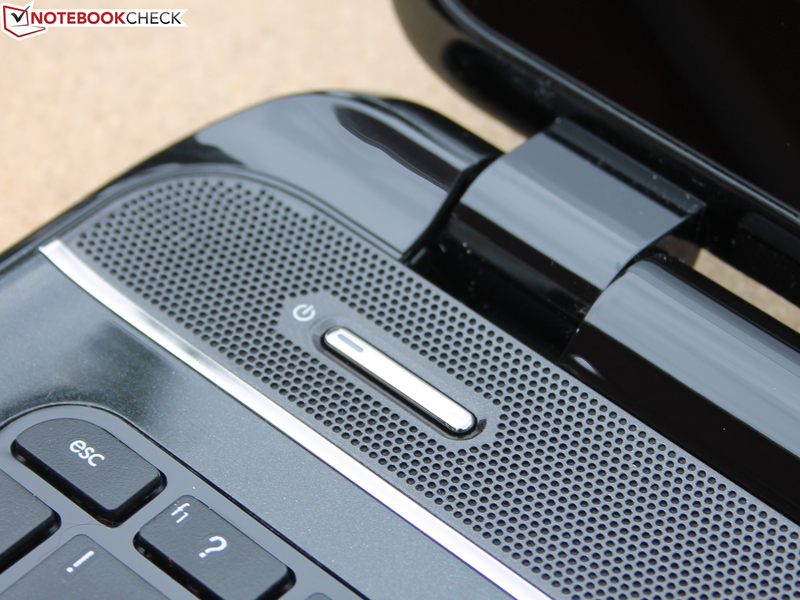 The low price point of the Sleekbook TouchSmart comes with strings attached. Notably, the creaky high gloss plastic chassis lacks some premium feel. The performance of AMD's A4-4355M and its integrated Radeon HD 7400G GPU is far worse than that of the Intel Core i3 or even the Intel Pentium (+ 125%) systems (this is also due to the slow HDD). In addition, weak battery life and a dim display don't help either. 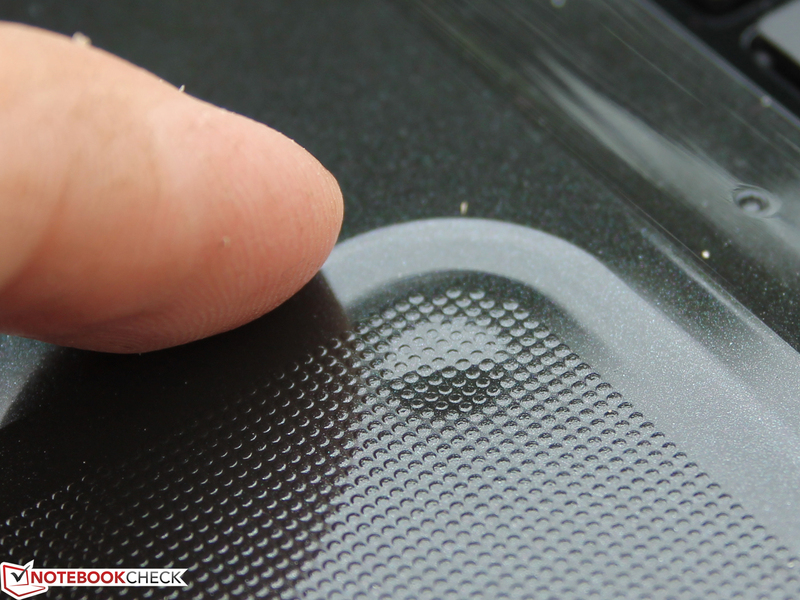 During outdoor usage (especially in the sun), the reflective touchscreen of the Sleekbook TouchSmart becomes unusable. Unfortunately, in terms of those two issues (display / battery life), the cheapish touchscreen-competitor made by Acer, the Aspire V5-571P with its stronger Intel processor, doesn't fare any better. 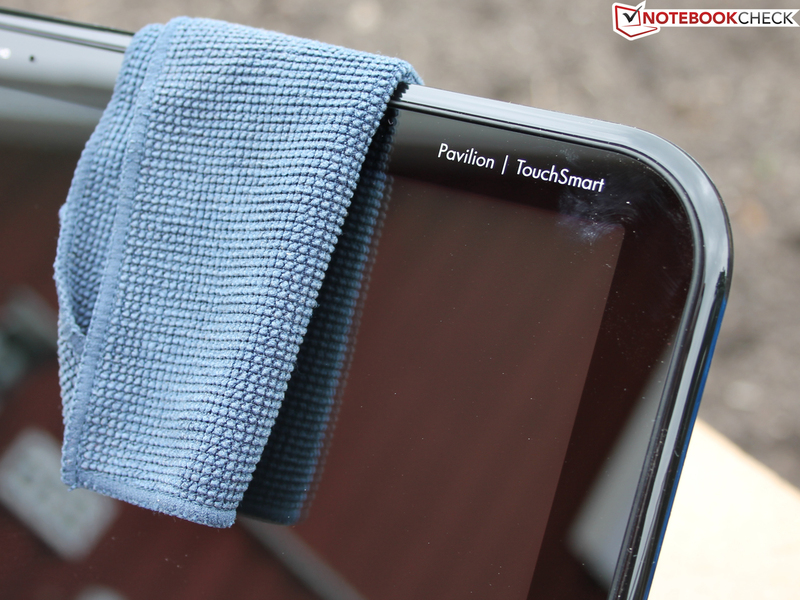 One of the few real arguments in favor of the TouchSmart remains its good ergonomics. However, this might not be enough to counterbalance its shortcomings. 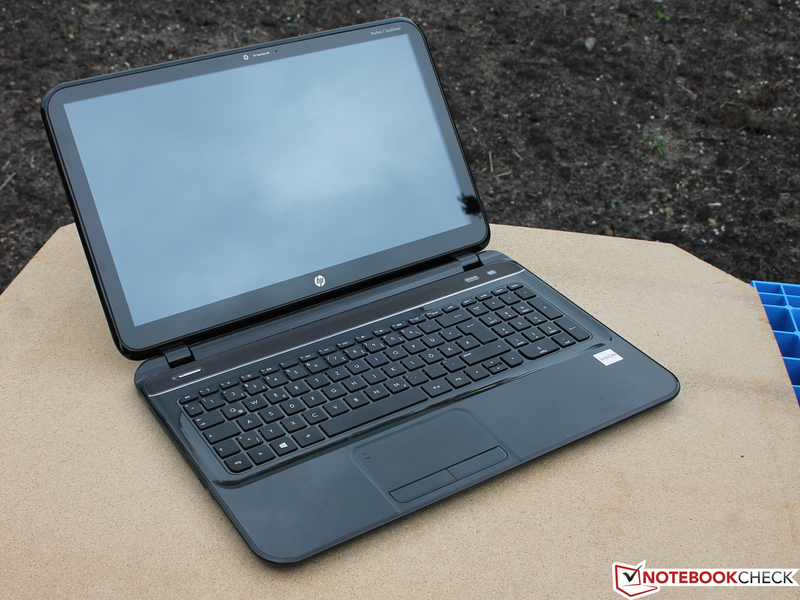 HP Pavilion Sleekbook TouchSmart 15-b153sg (D2W96EA): A cheap but slow touchscreen laptop. 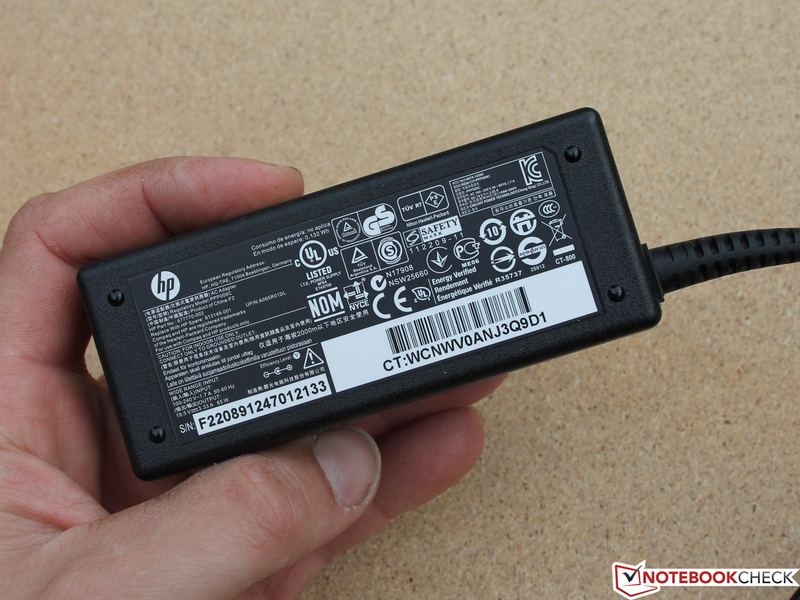 There are tons of laptops to be had for less than 500 Euros (~$653) - and many HP devices are among them. But a touch display - in an almost-ultrabook-thin 15-inch laptop - is still a rarity at this price point. 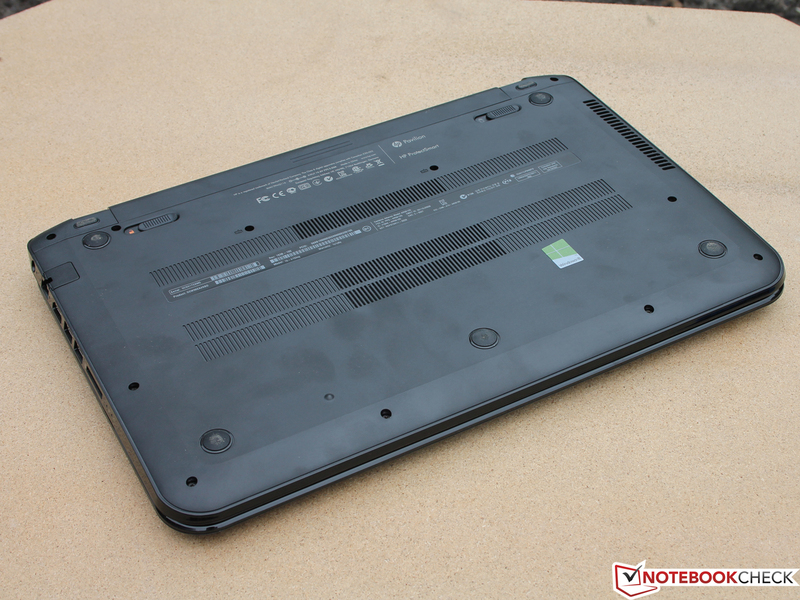 The Sleekbook TouchSmart is based on an AMD SoC. ...are far behind recent ultrabooks powered by Intel. ...but this is HP's fault due to choosing a weak battery. The high gloss finish is extremely prone to fingerprints and scratches. ...the edge-to-edge panel does so too. Its low brightness does not help in well-lit surroundings. The TouchSmart is actually unusable outdoors, even when it is cloudy. The surfaces have to be cleaned regularly. Without a polishing cloth, surfaces get smeared. The speakers offer mediocre sound at best. Nice: There is an actual Ethernet port. Our fingers slid comfortably over the nubby surface of the touchpad. Unfortunately, the mouse keys sport little travel while being ramshackle and loud. 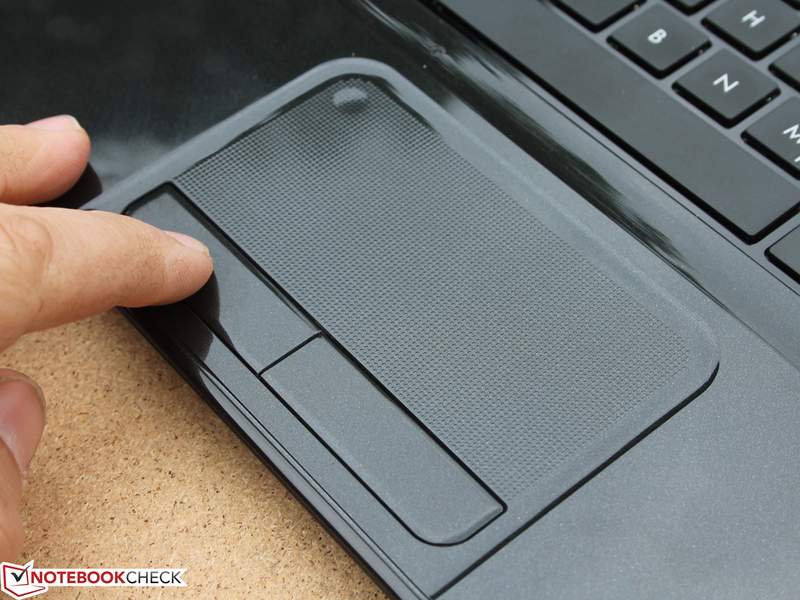 With this switch (which is common with HP laptops), the touchpad can be turned off. ...which should be more than suited for daily usage (withstanding quite some pressure). 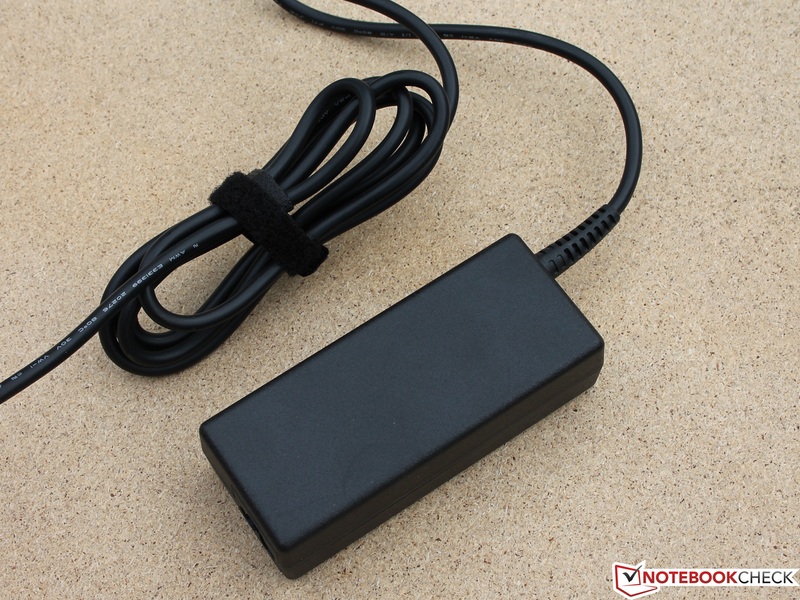 The 65 watts power adapter needs 1:48 hours for charging the device. A 45 watts power adapter would have sufficed, though - during our stress test, the laptop doesn't even need 30 watts. 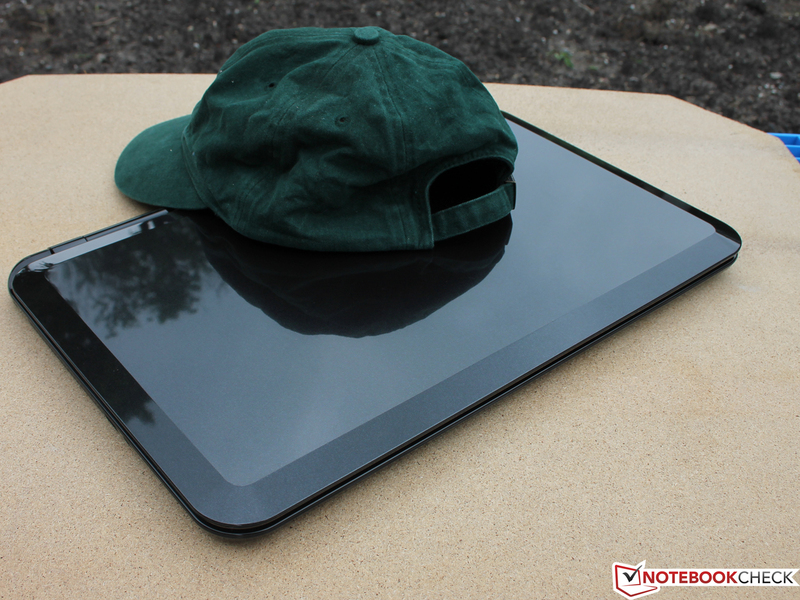 Such a glare panel is a common choice for tablets. Still, we can't help but feel annoyed by the abundant reflections. The panel can barely be made out during outdoor usage and under natural lighting conditions. The brightness is nowhere high enough. The sturdy display lid of the touch panel. Silent and cool - this is how every laptop should be. If it had to be a slow laptop, it could at least have been a highly mobile one, meaning one with a very bright display, great battery life and a stable base unit. HP manages to deliver none of these. Fingerprints and a greasy, glittery high gloss finish - this style doesn't fit in with the sedate zeitgeist at all. 15.6-inch laptops: Acer Aspire V5-571P, Asus VivoBook S500CA, Asus VivoBook S550. 11.6-inch laptop: Acer Aspire V5-122P (IPS display).